Me in my “happy place”. Much to my dismay, most of the South has had an extended winter season. Usually, by the time April rolls around each year, I’m shedding my long sleeve t-shirts and jeans in favor of shorts and flip flops. But Mother Nature had other plans for us as our usually beautiful spring has been plagued by cold weather and rain. Matter of fact, I took a trip down to Sandestin, FL with some friends from my tennis team in April thinking “Hey, I’m finally gonna get some warmth and sunshine!” But like a curse, the cold weather followed me with temperatures barely creeping past 70 for most of the trip!! Geeze Lousie – I can’t escape! Finally, with Memorial Day weekend ushering in the official start to summer, I’m finally getting my long-awaited sunshine. And as you probably know by now, what I paint is mostly affected by the season. When I think of summer, I envision vibrant, warm colors and of course anything related to the beach. Here are a few summer-themed paintings that I’ve recently completed that I wanted to share. This grumpy looking guy was a little overwhelming to paint at first, especially with all of his colored spikes! I really like how the sand background turned out with the pumice stone additive I applied to give it a gritty texture. The best part about this one is that I got to soak in some sun (and drink some wine!) while I painted him. 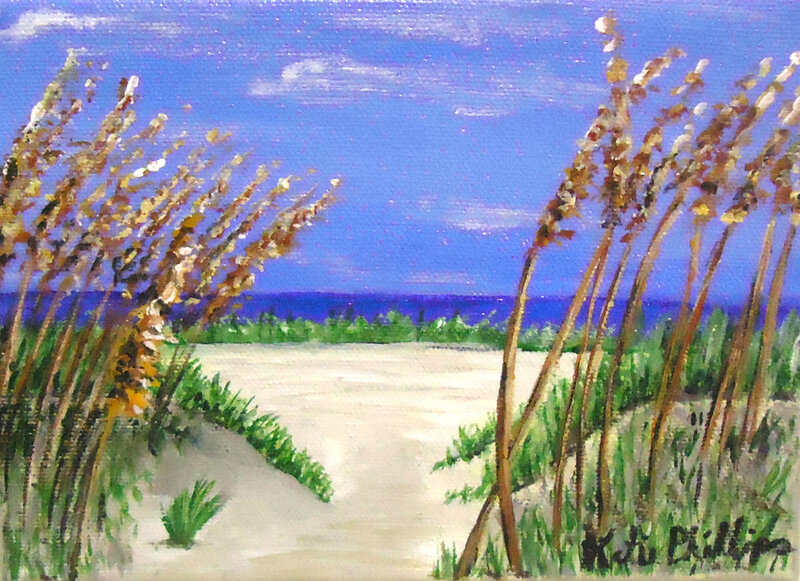 “The Path Less Traveled”- one of my tabletop paintings now available in my Etsy shop.